Here at Chesapeake Vein Center & MedSpa, we have a dedicated Venous Duplex Ultrasound Lab to objectively analyze your leg veins in order to determine customized, advanced medical solutions. Following this procedure, vein specialist Dr. Surya Challa can determine which varicose vein treatment, such as radiofrequency ablation, ambulatory phlebotomy (microphlebectomy) or sclerotherapy is right for you. The venous duplex ultrasound procedure utilizes sound waves, which bounce off blood vessels to create pictures. This allows board-certified phlebologist, surgeon and ABVLM certified physician Dr. Surya Challa to accurately access and treat your affected arteries and veins. Dr. Surya Challa has extensive training and experience in the field of surgery and phlebology, the specialty dealing with venous disease. He has conducted more than two thousand venous procedures, such as varicose vein removal, with extraordinary results, a superb safety profile and no major complications. What conditions does venous duplex ultrasound diagnose? Venous duplex ultrasound is a minimally invasive test utilized to diagnose the extent of diseased, varicose vein tissue, also known as venous disease. It allows Dr. Challa to accurately diagnose problems related to vein health as well as recommend and customize a result-oriented solution. It is frequently followed by sclerotherapy, radiofrequency ablation or ambulatory phlebotomy. Is this test covered by insurance? Because this procedure diagnoses the painful and uncomfortable symptoms of varicose veins, it is typically covered by insurance. For a list of the insurance carriers that we accept, please click here. Is this an outpatient test? The test involves ultrasound evaluation, which involves moving an ultrasound probe over the skin while recording images on a screen. Hence there is typically no pain associated with this test, unless your veins are tender to touch. This is an outpatient procedure. There is no recovery time necessary following an ultrasound evaluation. Dr. Challa is a board-certified surgeon and is a very experienced vein doctors and specialist in the Hampton Roads area. He has treated more than 3000 patients and performed over 2000 ultrasound guided procedures. Typically, comprehensive Ultrasound evaluations are performed by a dedicated Vascular Ultrasound Technician. Our patients come from throughout the Hampton Roads area of Virginia to experience our superior standard of care. We serve Chesapeake, VA and the Virginia Beach area in Norfolk County. Is Chesapeake Vein Center and Medspa accredited by a national organization? 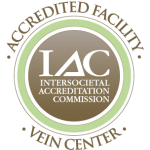 Yes, we are accredited by the IAC, the premier vascular imaging accreditation organization.